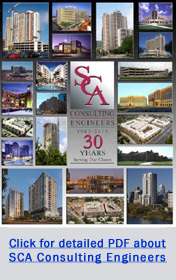 SCA's past performance history and the "Team" concept have established the reputation for SCA's basic philosophy to provide the highest degree of professional engineering service and expertise on each project. SCA provides a competitive wage and salary package based upon an applicant's knowledge and experience plus a 401k plan, employee benefits package with medical, dental, life and disability insurance as well as paid holidays and vacation/leave policy. Revit BIM Modeler/Production Design Position for a structural engineering firm. The position requires advanced knowledge and experience using Revit and AutoCAD to create structural construction documents. An Associate's Degree with study in Revit Structure and 0 to 2 years working experience is preferred. Excellent written and verbal communication skills are required as the applicant will collaborate with staff structural engineers, architectural designers and other consultants throughout the entirety of the design process for buildings in the commercial, hospitality/hotel, multi-family/residential/apartment, financial and health care industries working with concrete, steel and wood construction. We are looking for a structural design engineer with zero to five years working knowledge of structural design and engineering techniques. Responsible for planning and conducting design work on building structures requiring judgment in the evaluation, selection and application of engineering techniques, procedures and criteria for various project types, including but not limited to concrete, steel, masonry and wood. • Perform structural design and analysis calculations using governing codes and standards, engineering formulas, skills and experience. • Structural engineering plans, design and layout. Layout and detail portions of projects using schematic layout by project lead engineer. • Provide drawings and/or sketches for designs to be incorporated in construction drawings by drafters. • Research design options for project lead engineer. • May serve as Project Engineer and as Client contact on projects. • Use computer-assisted engineering and design software to prepare engineering design documents. • Attend and participate in project meetings. • Perform field activities such as observation of construction progress and existing field conditions. • Effectively communicate project progress and issues to the design team and maintain communication with the team members throughout the course of the project. • Capable in managing and performing projects in a fast paced environment. • Bachelors Degree in Civil / Structural Engineering. Masters Degree preferred.